Cooking with love adds soul to food—indeed! Well, agree or not there’s no joy greater than having our favorite meal with our loved ones isn’t it? Not just eating, but cooking is equally rewarding too. It gives us immense pleasure and rejoices our soul. Not all cooking experiences are as bad like Jack Pearson (This is US) had, right? Can you believe a Crockpot was the reason of his tragic demise! Twitteratis are still laughing their head and hearts out over this. Alexa is like our virtual family member creeping into almost every modern day gadget we have around. Dash Wand is a pretty useful alternative, much cheaper than Echo Dot for Kitchen if you’re running low on budget. It supports a bunch of features including finding recipes, exploring nearby food joints, converting measurements and more. You can even stick the device on your fridge, it’s highly durable and water resistant as well. Not every smart gadget has Bluetooth radio, right? We hereby present you the 3 in 1 Good Grips Avocado Slicer that’ll help you slice avocados easily without slicing your fingers. This is surely one must have gadget for your kitchen rack. So what if doesn’t support a LED screen or Bluetooth transmitter. At least it’s handy and will help you get things done in a jiffy. What more do we want, right? Gone are those days when we had to consistently keep an eye on the BBQ oven without leaving it alone even for a second. Its 21st century folks! 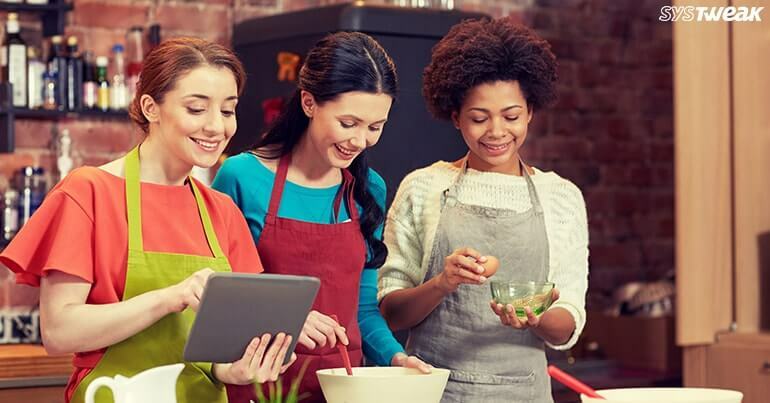 Technology has made cooking also easier with smart gadgets. Nutrichef’s smart BBQ Grill Thermometer can let you have a peace of mind while you can monitor oven’s temperature on your Smartphone. As soon as the meal reaches the desired temperature, you’ll get a notification alert on your Smartphone. Now you can easily mingle the party without worrying about the heating oven! An ideal kitchen gadget for fitness enthusiasts or those who care more for diet, rather than cakes and cookies. Once you place the items on the tray the device will display the exact amount of protein, carbohydrates, lipids and all sorts of nutrients that are contained in the food. Apart from this, the gadget is also great for weighing food items in your kitchen so you be precise with measurement. Do you find shredding meat one hell of a task? Well, not anymore! With LauKingdom Meat claws shredding meat becomes way more fun. You can not only use it for meat but also find other useful purposes for this smart gadget. Carry hot food without burning your hands, rip the turkey or beef and more. Guess it’s time to give up on old fashioned ways and stick to smart methods instead. What say? Hope these 5 useful gadgets can make your kitchen experience much more delightful and finger lickin’ delicious!